If life was fair, we would only get dark circles for staying up too late or partying into the wee hours of the morning. Sadly life is not like that. No matter how early you get to bed, or how much sleep you get, under eye dark circles can still be your mirror’s morning greeting. If you are especially vulnerable to them, you probably hate the way they age you and how tired they make you look. So what causes dark circles and what remedies are available to prevent them? Your genetic makeup, heredity, DNA, or whatever you call it. The thickness and skin transparency that cause dark circles is inherited. People with thicker, less translucent skin on their faces will be less likely to have dark circles. You also inherit your capillaries and their strength. Capillaries are what move the blood along beneath your skin. If the walls of your capillaries are weaker, then you are more likely to have under eye circles for the same reason you may have varicose veins on your legs. If you are unlucky enough to have inherited the ‘dark circles’ gene, then you really cannot do a lot about it, you are simply more prone to getting them. Your bone structure. If your eyes are set deep, then you will have natural shadowing that will make the under eye circles seem a lot more severe. There is not much you can do about this, either, since bone structure is another inherited trait. Anemia. This is a caused by a deficiency of nutrients, especially iron, in your body. It is even more severe in women, especially if they are pregnant or on their period. Under eye circles are not a by product of anemia, rather it makes your skin paler, so your dark circles will stand out more. If you eat better food, including green veggies, lean meat, and whole wheat bread (all of which have a lot of iron) or take vitamin supplements, then a lack of iron should not be a problem anymore. Damage from the sun. Here is one thing you can do something about. You may be suffering from under eye circles because of hyperpigmentation which means you have more melanin in the skin around your eyes. To keep them from getting worse, wear a sunscreen with a high SPF level and ultraviolet resistant sunglasses that cover the entire area around your eyes. Your age. Sadly as we advance in age, collagen levels decrease and skin things and is less able to bounce back, allowing the blood to show through the skin more. Not only that, but capillaries weaken as well, and this just makes everything else even worse. 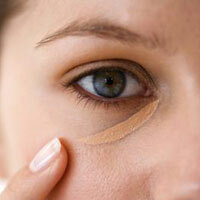 Be careful with the sensitive skin around your eyes and apply an general eye cream cream twice a day. What would be even better is an eye cream for dark circles because it is specifically made to combat under eye dark circles. Medications. Some kinds of medication dilate the blood capillaries. If you have recently been started on a new medication, your under eye circles can seem worse, or perhaps there will be some where you did not have any before. However, no worries, this should be temporary. Hydration levels. Sometimes dark under eye circles mean that you are dehydrated because you are not drinking enough water. Keep yourself hydrated, especially when it gets hot or when you exercise. Not enough sleep. You do not actually get dark circles if you do not sleep, however not enough sleep will make your skin paler and contrast with dark circles. To remedy this, you must simply get to bed early enough that you will be able to get enough restful sleep each night. Make sure you get enough sleep regularly. You may not be able to control the causes of eye circles, but there are answers, thanks to cosmetic science. Everyday, there are people working on designing better and better eye creams and gels that can combat dark circles better than their predecessors. And if you want to hide your under eye circles, you can always purchase an under eye concealer that will reflect the light. So to keep dark circles to a minimum, you should take care of the skin under your eyes, use good makeup, eat food that is good for you, keep your eyes protected from the sun, drink lots of water, and get plenty of regular sleep.